The deadline to apply for 2019 has passed. Please check back in the fall of 2019 for the 2020 application deadline. Must be a farmer vendor at a BCAFM member farmers’ market. Applicants must reside in BC. Farms must be located in BC. Project implementation must be completed by the end of 2019. Upon project completion, the grant recipient will be required to submit a brief report to BCAFM. Regenerative agriculture. Examples include but are not limited to, the creation of on-farm composting systems, the use of cover crops for building soil structure, increasing biodiversity on the farm (in regards to microbiology or livestock). Involving future generations in the farm lifestyle by making the farm more accessible to children. Increasing accessibility for those with physical or mental challenges. Examples include buying items such as high stools and foam mats for comfort during farmers’ market days, investing in bins and crates that are easy to carry while using a wheelchair. 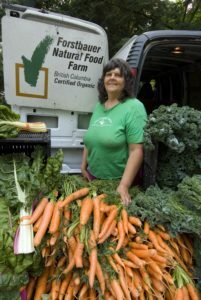 Forstbauer Family Natural Food Farm was founded in 1977 when Mary and Hans Forstbauer bought a seven-acre farm on the Matsqui Prairies (near Abbotsford). As many recognize, Mary and her husband Hans were pioneers in the organic farming movement for over 30 years. Mary was and still is the embodiment of organics in BC, and her children proudly continue this legacy. In addition to farming, Mary volunteered on many non-profit boards. She was a founding member and president of the BC Association of Farmers’ Markets (BCAFM), and served on the boards of the Certified Organic Associations of BC (COABC), the Bio-Dynamic Agricultural Society of BC, and the Artisans Farmers Market Society. She was also the 2015 recipient of Canadian Health Food Association Organics Achievement Award. Mary was instrumental in building the local food movement and farmers’ market community in BC. Her top priority was to get as many farmers involved in farmers’ markets as possible and she did a lot of peer mentoring to help make this happen. Mary was admired and loved by many in the farming and farmers’ market community and sadly, Mary passed away in 2015. 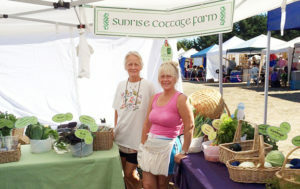 Congratulations to Sue Hughes of Sunrise Cottage Farm who sells at the Metchosin Farmers Market. With the grant, Sue will be building a proper post-harvest cleaning, washing and packing station to the farm. They will also include a wheelchair accessible section in the packing out area so more people can engage in farming activities in a comfortable, safe and warm manner. Congratulations to Kritsi McCrae and Paul Keays of Barndance Farm, recipients of the first Mary Forstbauer Grant! They plan to build a concrete composting bay at their greenhouse site to more efficiently collect, store and turn their garden compost.